Films like Jurassic Park have led us to believe that Tyrannosaurus rex was capable of chasing down its prey at full tilt. New research done with simulations suggest this dino was no sprinter, and that it couldn’t move any faster than a brisk walk. Well, a brisk walk for a nine tonne carnivore. At a top speed of 12 miles per hour, you’d still have a hard time outrunning this prehistoric beast. New research published in PeerJ suggests the size and weight of a T. rex would have prevented it from running, and that it couldn’t move any faster than 5.4 meters per second, or 12 miles per hour. Any faster, and the leg bones of this biped would have collapsed and buckled under the tremendous weight. This means that T. rex was unable to pursue its prey at high speeds—but high speed is a relative term. For reference, typical humans can sprint anywhere between eight to 15 miles per hour (elite athletes can exceed 20 mph). So to outrun a T. rex, many animals—or fictional humans—would still have to run like hell. 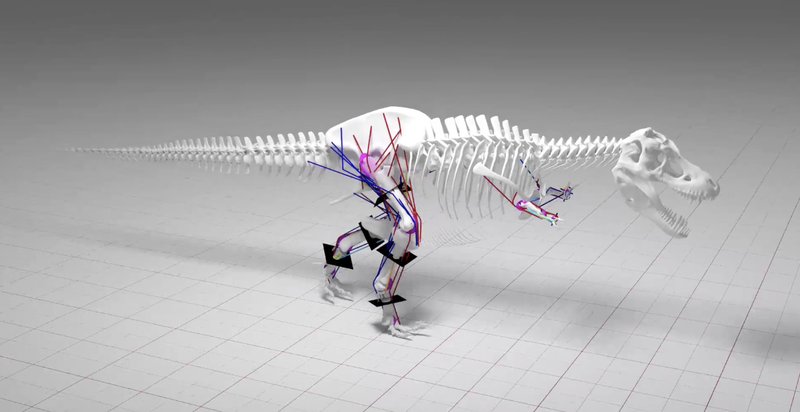 Paleontologists have been debating T. rex’s running ability for decades. At the high end, some research has suggested that T. rex could run a blistering 20 meters per second (45 mph), while more recent research has suggested a more manageable pace around five to 11 meters per second (11 to 18 mph). This latest study, led by William Sellers from Manchester University’s School of Earth and Environmental Sciences, affirms the low end of these estimates, while also demonstrating, through the use of computer simulations, that T. rex was incapable of running. Instead, the study suggests it walked briskly in a “bird-like” manner. For the analysis, Sellers combined two established techniques used to study the biomechanical properties of animals, namely multibody dynamic analysis (MBDA) and skeletal stress analysis (SSA). This is the first time palaeontologists have combined the two approaches, and it’s creating a more accurate portrait of dinosaur physiology. Previous simulations failed to consider the effect of “skeletal loading,” that is, the limits to how much pressure bones can bear before snapping. For the new study, the simulations calculated all the forces in the T. rex’s limb bones, and then produced an estimate of the bone loading on impact. Results indicated that any running gaits for T. rex would have undoubtedly led to “unacceptably high skeletal loads.” In other words, any kind of running would have broken this dinosaur’s legs. The new findings suggest that T. rex couldn’t pursue its prey in a high speed chase, and that it led a less athletic life than previously assumed. But it was still a predator to be feared.